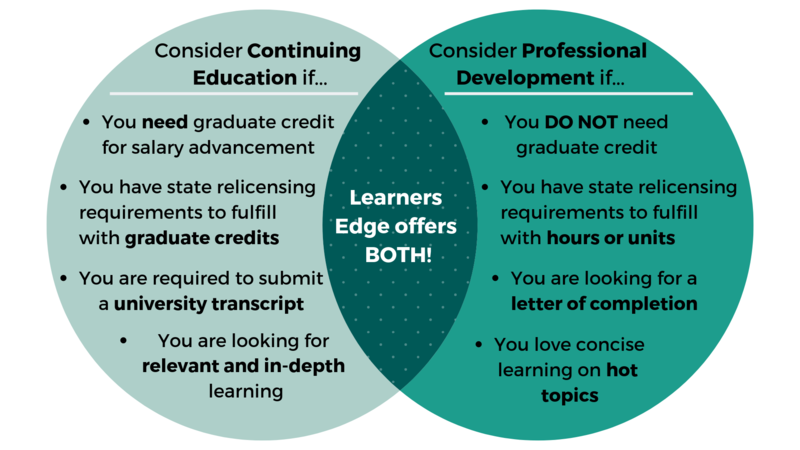 Below is a summary of how Learners Edge may help your continuing education and Idaho educator certification renewal needs. This summary should in no way release individuals from their responsibility of ensuring that the course they take meets their professional needs. We hope it provides assistance in understanding how Learners Edge might help you in the accumulation of clock hours or graduate credit for salary advancement and the Idaho teaching relicensure process. See the Idaho State Department of Education for complete ID teacher relicensure information. As of September 1, 2015 - an audit system for renewal credit is no longer valid. Official transcripts and/or in-service forms showing verification of the six (6) credits earned during the validity period of the credential must be included with the application. If a multi-subject K-8 teacher or K-12 special education teacher, you need verification of completion of the Idaho Comprehensive Literacy Course (ICLC) or passage of the Idaho Comprehensive Literacy Assessment (ICLA). If an administrator, math teacher, or K-8 teacher, you need verification of completion of the Idaho Mathematics In-service Program (MTI/TMT).